This lab has been a successful collaboration between SENS and CIT since 1998, when the DEC VT-420 terminals were replaced with Sun SPARCstation 5 systems. It currently contains 68 Dell OptiPlex 745 workstations running SENS Linux, and all users with valid UBITNames can use this facility. SENS users can also access their Node shared directories. For a current list of open hours for this lab, as well as additional information on the resources available in it, please refer to the CIT Bell 101 Public Site page. 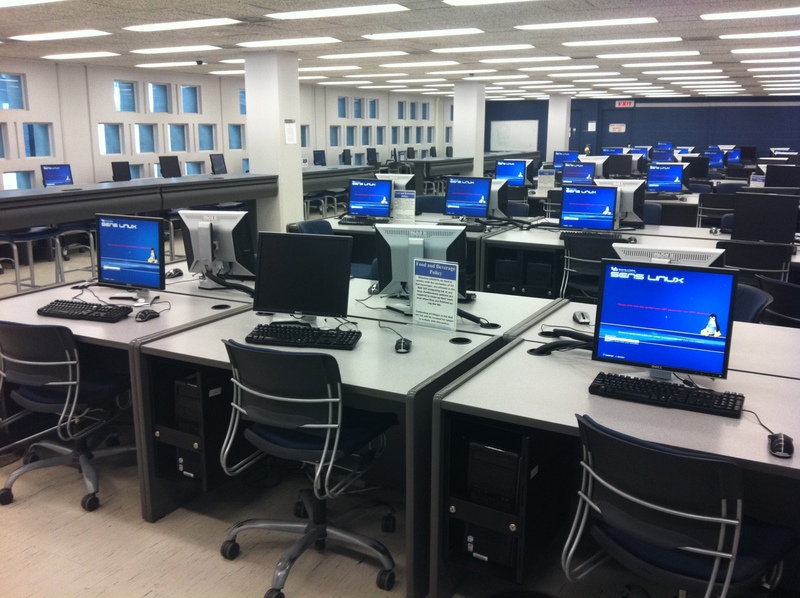 If you need access to software available in this lab during hours when it is closed, please refer to this page to learn how that software can be accessed remotely. For a map of the facility, which also shows the status of the systems in it, click here. Printing is available in this facility. 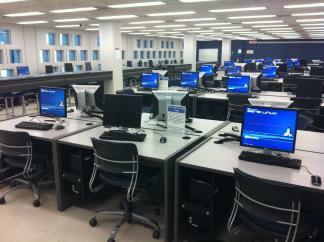 Wireless access is available in this facility. Consultants are available at all times. The systems in this lab are named after Shakespearean characters; although the layout described below has changed from the original configuration, we are reluctant to change the text because it is so creative. Starting with the consultants table, we have Rosencrantz, Guildenstern, Oberon, and Titania - a fae king and queen who never really owned anything, and two people who constantly did the king's bidding and ended up getting killed for it. Perfect for consultants. Up the left side we have first the triumvirate who took over after the assassination of Caesar: Lepidus, Antony, and Octavius. Opposed and across from them, naturally, are three kings: Duncan, Lear, and Agamemnon (all three fated to die as well, I might add). Behind Lear sit his three daughters: Regan, Cordelia, and Goneril. Cordelia, being the only faithful one, calmly watches over the back of her father. This being a woman's table, we have on the other side three more doomed females: Ophelia, Gertrude, and Desdemona. Opposite them we have the "Villains Table," a veritable gallery of rogues. Claudius sits behind his queen (Gertrude), flanked by Iago and Shylock. Across from Claudius we have Hecate, goddess of evil, flanked by the warring lords of the houses Montague and Capulet. Behind them we have our "Warriors Table" - Achilles, Aeneas, and Ajax seated across from Patroculus, Ulysses, and Hector. Patroculus is across from his friend Achilles and across the table from Hector, who is fated to slay him; Achilles and Hector are at diametrically opposed ends of the table. Behind these two we have Balthazar and Balthasar, two names popular throughout many of the Shakespearean plays. They add a minor - but necessary - amount of confusion to the whole deal. Moving on to the right side and coming down, we have Moth and Cobweb forgotten against the wall (Cobweb conveniently closest to the corner of the room). In front of them we have the rest of our Unseelie Court: Mustardseed, Peaseblossom, Elbow, and Froth (frothing in the corner, no doubt), across from four spirits/goddesses: Ariel, Iris, Ceres, and Juno. After this we have a Court of Fools: Puck, Polonius, Dogberry, and Fool opposite Snug, Pinch, Bottom, and Snout. Following this we have four hotheads - Cressida, Caliban, Caithness, and Mercutio - seated across from four levelheaded figures - Troilus, Trinculo, Prospero, and Volumnius. Troilus sits opposite his lover, Cressida, while the loyal Trinculo sits opposite the treacherous Caliban (both from "The Tempest"). After this, we have Albany, Burgundy, Cornwall, and Quince set against Sebastian, Miranda, Oswald, and Voltimand; and finally we have our second Warrior's Table: four warriors loyal to the king (Fortinbras, Horatio, Banquo, and Kent) seated opposite four noble warriors who opposed Caesar (Brutus, Cassius, Flavius, and Cato). Description courtesy of Chester H Zeshonski (chz@buffalo.edu).